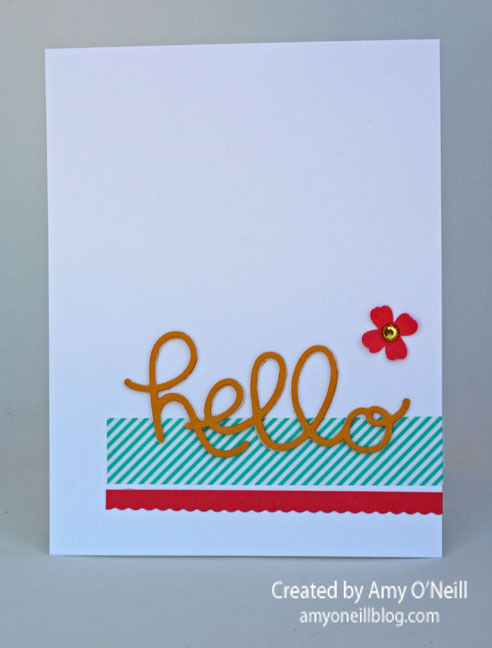 Here’s a super simple card for you today, and no stamping. I used some of the new Birthday Bash Designer Washi Sheets for the Bermuda Bay stripes. I love how you can make washi tape in any size with these sheets. The “hello” was cut out using the Hello You Thinlits, and the Calypso Coral was cut using one of the Stampin’ Trimmer Rotary Cutting Blades. We’re celebrating another birthday in our house today. My oldest turns sixteen. It’s a holiday today and there is no school. That’s pretty cool when that happens on your birthday, huh?